Spray 9-inch square pan with cooking spray. In large bowl, mix cereal, dried fruit, sunflower nuts and peanuts. In 2-quart saucepan, heat brown sugar, corn syrup and peanut butter to boiling over medium-high heat, stirring constantly. Boil and stir 1 minute. Remove from heat; stir in vanilla. Pour syrup over snack mix; toss to coat. Press firmly in pan. Cool completely, about 30 minutes. For bars, cut into 6 rows by 4 rows. 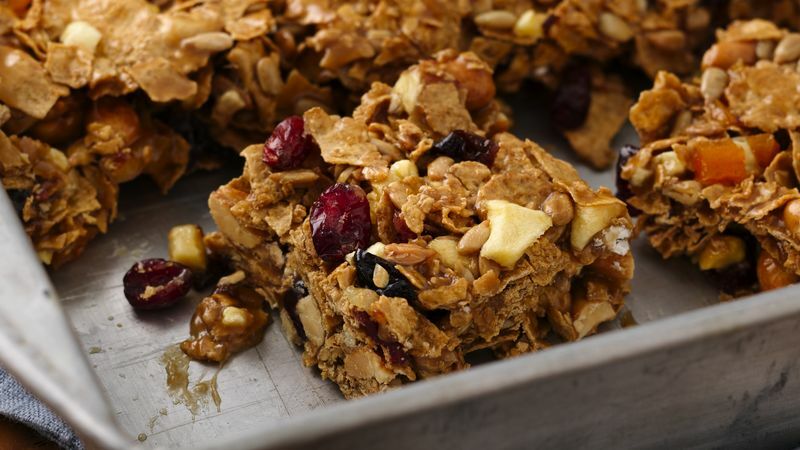 Get creative and replace the dried fruit and nuts with different flavors. Try dried cranberries with pistachios or dried apricots with almonds. Replacing saturated fats with unsaturated fats from nuts and seeds may help lower blood cholesterol. But fats are high in calories, so keep portions small.